I hit “post” and then proceeded to read my friends’ News Feed for the morning. That’s when I realized I deserved the Worst Mother of the Year Award. Every single post of every single parent of a school-aged child had already uploaded a photo of their little angel’s first day of school. The kiddos were carrying Angry Bird lunch boxes and had Dora the Explorer backpacks over their shoulder blades and their spotless shoes were glittering and their shiny outfits were so new the tags were probably pulled off on the way to class. They were posing with old friends and new teachers, clutching siblings, and wiping the tears away from their sobbing parents. I, on the other hand, had completely forgotten about that precious Kodak moment. And now it was too late. It’s not like I could barge into my 16-year old’s French III class with my iPhone blazing. “Excusez-moi, Madam,” I could have said, and that would be the end of it since I don’t speak French. Then I’d take a quick snapshot of my daughter hiding under her desk. For the rest of her high school career, she would be known as That girl with the crazy paparazzi mom. I wouldn’t have been allowed to sneak into my 11-year old’s drama production class and loudly proclaim to her teacher that being the thespian that he is, he should understand why I must stop the class in their tracks from learning a Shakespeare sonnet or a David Mamet play or some improv demonstration where they all pretend to be caterpillars just so my daughter can be seen on the big screen (big depending on how large your computer monitor is). Normally I humiliate her just by breathing. This stunt would have pushed her so far over the edge that she probably have come home and tried to OD on gummy vitamins. And now that my baby boy is a big 1st grader, he’d be completely mortified if I popped into his new class and interrupted a lively reading of Junie B. Jones. Then I’d reposition him and shove another of his soon-to-be-former friends into the group. Then he’d excuse himself to go to the little boys’ room and never come back. I could have had my first day of school Facebook photos. But alas, I missed my moment. I took it after my kids got home. Notice that Emily and Mary are already wearing their pajama bottoms. 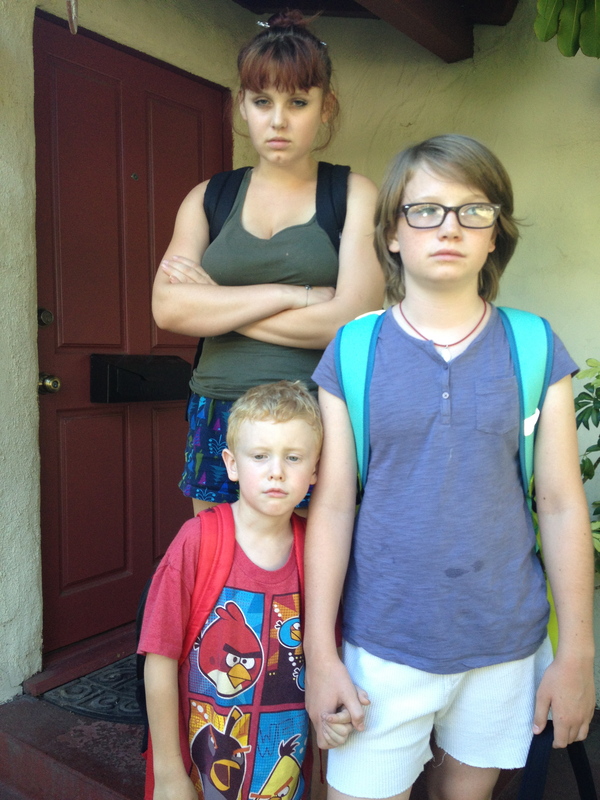 It’s too late to capture that first day of school moment. But at least I still have time to embarrass my kids. All 3 look so tired. It must be their bed time. Either that or they weren’t happy about being at school. Have you figured out by now that moms aren’t perfect? We want to be, we keep trying, we sometimes think we are………then we either do something stupid or forget to do something extremely important (failures and shortcomings are always extremely important in retrospect) and come crashing to earth ready to go belly up with mortification. In the last picture I told them to look miserable – which they were since they didn’t want to have their picture taken after the fact. And yes… they were tired. After all, it was the first day of school after a shortened summer vacation. Okay, seriously? If my mother had insisted on first day of school pictures ANY year of my school life I think I would have stopped speaking to her. I think that Facebook has tried to turn every single moment of lives into Moments To Remember and Photograph. The first day of school is a beginning, but most kids are going to have at least 13 of them in their lives; more if they go to college. Honestly, don’t worry about it. I’m sure your kids won’t, and that’s more important than Facebook and everyone trying to look like the perfect family (sorry if this sounds a bit harsh, it’s something that’s bothered me about Facebook and families for awhile). We’re now a week into it and people are still posting first day photos. My daughter stopped allowing First Day of School shots in about the 5th grade. Although now that I think about it, I do have some that are, let’s just say, unfit for publication! So, your kids should get “Good Sport” stickers (especially the older ones). I definitely want to see the unfit for publication ones. If it wsn’t for Facebook, no one would be worried about taking pictures of the first day of school. I think Smartphones have pushed it as well. I hate when that happens! But actually, ten years from now it won’t matter that you got the photo before school or after – you’ve captured them at a certain age and it will be fun to look back. Thanks. I hope so. It’s not like they’ve aged much in 7 hours. I’m planning mine! 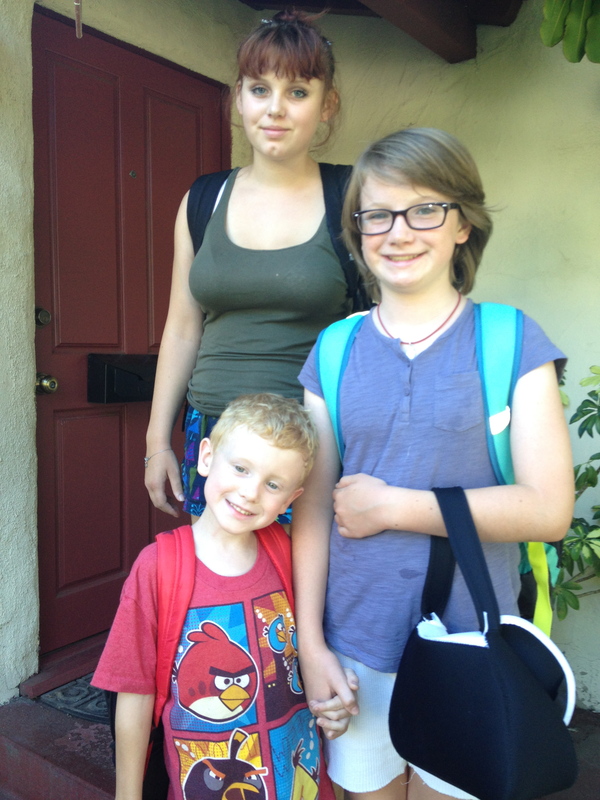 Of course, this is Ally’s first YEAR of school ever, so it’s a bit of a big deal. I don’t even have Facebook any more lol, but I’ll probably post about it. Y’know. Wow! I don’t know anyone who’s dropped Facebook. How do people wish you a happy birthday? Do they resort to the old fashioned thing and just call you or mail you a card? When are you writing a novel? Shoot – it’s hard enough for me to find time to post an 800 word blog. Thanks though.